Koshari is Egyptian street food which combines rice, lentils and pasta, one or two of which is always in my refrigerator. This is one of my favorite meals to throw together. Make the rice, pasta and lentils ahead of time for the ultimate in leftoveres or make them for this dish and then have more leftovers. For the sauce, dice one small onion and sauté in oil until soft. Mince the garlic and add to the onions. When it is fragrant, add the tomato sauce, tomato paste, cumin, lemon juice and salt and cook together for about 10 minutes or more if you have other things cooking. For the onions, slice the onion into crescents and place in a frying pan. Dust with paprika (that’s how my Mom fried onions!) and fry until crispy. To assemble, place the rice on the plate and top with a layer of lentils. 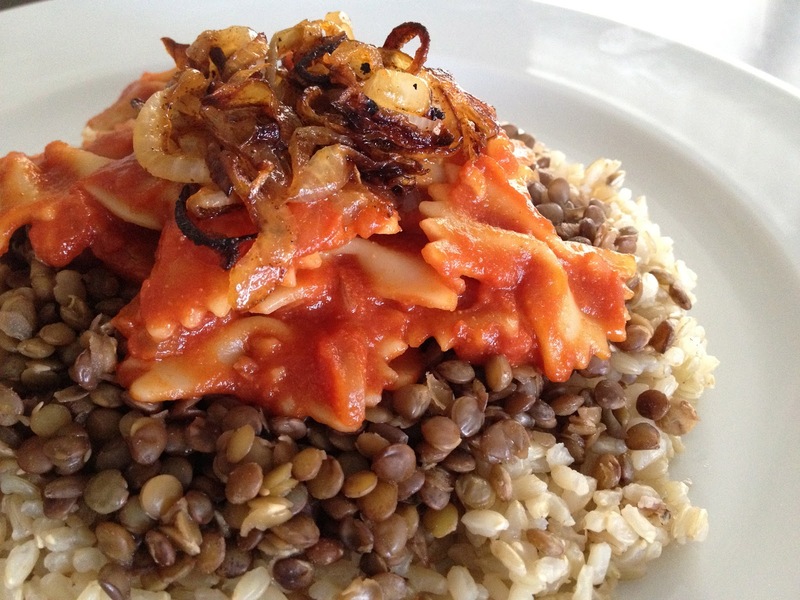 Mix the pasta into the sauce and then on top of the lentils. Top with fried onions. Enjoy!